While Formula One fans are counting the days until The Show That Never Ends begins anew with the Australian Grand Prix, backstage and behind the scenes the producers of the show are still going about the business of deciding who owns the theater. It is a complicated story, but Thomas O'Keefe wades in and sheds some light on the financial cobwebs of F1. In the beginning there was Bernie Ecclestone, and as Commercial Rights Holder designated under the Concorde Agreement, he controlled through his own group of companies the marketing of the commercial rights to Formula One, especially the TV broadcasting rights to the sport. In 1998, Ecclestone began the process of planning for an initial public offering of Formula One stock to the public on the London Stock Exchange, a "floatation" as it is called in English legal parlance. That was Plan A. Unfortunately, Plan A was thwarted in a couple of ways. To begin with, the European Commission, in the form of Karel Van Miert - head of the Competition Directorate, the antitrust division of the EC - announced that it had received complaints that Ecclesone's companies and the FIA were acting in a monopolistic way with respect to the assignment of the commercial rights from the FIA to Ecclestone's companies. While the EC has no formal power to stop a floatation of Formula One on the stock exchange, the pendency of the investigation, which was formally announced on May 29th 1998, was bound to have a dampening effect on the market for shares. Ecclestone is not one to sell too cheap, so although he could have continued with the floatation of stock to the public even while the EC matter was underway, he moved on in June 1999 to Plan B: sell $1.4 billion in bonds and wait until the Sword of Damocles of the EC was lifted to have the public floatation. Bonds are debt instruments that bear interest rates and have to be paid back, presumably from the revenues received by the sale of TV rights amongst other means. The revenues from Formula One are sufficiently stout to pay the debt service on these bonds, which is reported to be about $105 million annually. Plan B worked for a time, but the EC proceeding went on forever and got to be an increasingly bitter struggle, somehow mixing in European politics with European Competition Law, until finally it was announced that a three-day hearing would take place in May 2000. By this time Professor Mario Monti had replaced Van Miert as head of the EC's Competition Directorate; Monti was thought to be more professional, more even-handed, and less of a zealot in his handling of the case against Formula One. Suddenly, just five days before the hearing, the EC released a statement postponing the hearing indefinitely, in order "to discuss settlement proposals in more detail." From May 2000 to date, a settlement process has been unfolding behind the scenes and Ecclestone in mid-January 2001 stated that he had been told that the matter is to be sorted out soon. "We have changed all the things they thought were wrong and hope for a decision soon," he said. "I have heard that within the next few months they will be satisfied." In the meantime, Plan A (sell Formula One stock to the public), and Plan B (sell Formula One bonds in a private bond offering to sophisticated financial institutions) evolved into Plan C, which led to Ecclestone selling up to 50% of his stock in a company called SLEC (named after his wife, Slavica Ecclestone) by means of private sales of stock to a variety of sophisticated investors, in a so-called "private placement", including two investment banking firms, Morgan Grenfell Private Equity (to whom Ecclestone sold 12.5% of SLEC) and Hellman and Friedman (to whom he sold 37.5% of SLEC), together aggregating 50% of SLEC divided between the two holders. As investment banks often do, these two entities then "flipped" - or re-sold - their collective 50% interest in SLEC to EM.TV, a media and merchandising company in Germany that had previously acquired Jim Henson's Muppet Company to add to EM.TV's existing library of children's television programs. EM.TV was a high flyer on the Neuer Market, the stock market in Frankfurt. After this series of transactions had been completed, this is who owned SLEC's shares: Ecclestone and his family's trust, Bambino Holdings (50%), EM.TV (50%). 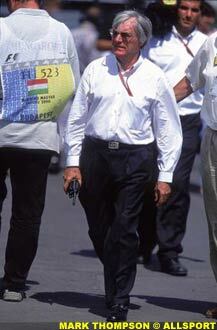 And, according to Ecclestone himself, this is who controlled SLEC: Bernard C. Ecclestone. It seems that although EM.TV spent $1.6 billion dollars in cash and stock in March 2000 to buy 50% of the stock of SLEC, that purchase did not include buying 50% of the voting power: some shares it seems are more equal than others. Sometimes in structuring a transaction, an existing shareholder who founded the company retains a disproportionate amount of voting control or creates a separate class of stock to sell to outsiders and something like that appears to have happened here. So anyone who buys EM.TV shares buys some form of equity in SLEC but not necessarily voting power proportionate to the 50% equity. As Ecclestone told F1 Racing in October 2000: "EM.TV have a 50 percent share, but no control. No control whatever. [EM.TV's head, Thomas Haffa] could sell his shares to whoever he wanted, and it wouldn't make any difference because they wouldn't have any control. Their 50 percent is like having 5 percent. The control rests with the trust, and I am still the chief executive of the company that the trust own." One other feature of this transaction is a so-called option that apparently puts a further 25% of SLEC stock in play depending on the circumstances. The terms of that option or options have been variously reported as a "put" or a "call" option. Logically, it would seem that EM.TV should have negotiated a right to buy a further 25% of SLEC, that would be a "call" option, a right to buy stock under certain conditions, for example, if there were to be a public floatation, or if and when the EC case got settled, or by a certain expiration date, giving EM.TV the right to increase its holding in SLEC to 75%. Correspondingly, it has been reported, again not authoritatively, that Ecclestone has a "put" option vis-a-vis EM.TV that is good until May 2001 that gives him the right to sell a further 25% of SLEC under certain unknown circumstances, which would have the effect of forcing EM.TV to buy those shares if the put was exercised by Ecclestone. The price is rumored to be $1 billion. The current problem is that EM.TV is in a financial squeeze - its stock has dropped well off its highs on the Frankfurt stock exchange and it may not have the funds either to acquire the next 25% of SLEC, if it has a call option, or to satisfy Ecclestone's put, if that is the way the option works; either way, it is half a billion to a billion dollar issue. Thus, EM.TV now needs partners and it is looking at Kirch Gruppe - another German media firm, which has reportedly offered $550 million to buy approximately 24.5% of SLEC, or almost one half of EM.TV's holdings in SLEC. Among its assets, Kirch owns Premiere World, which carries the digital coverage of Formula One. Kirch and EM.TV have had close business ties over the years. Ecclestone, however, has let it be known that Kirch would not be buying control if it becomes a SLEC shareholder, but Kirch or any other buyer would be subject to his put as a transferee of EM.TV's stock. As Ecclestone told The Sunday Times recently: "It doesn't affect me at all. The fact that they are being sold cheaper is because EM.TV is distressed ... I don't care who owns the shares. It would make no difference to what I do." In any of these multi-partied transactions, there is often a player called the White Knight, someone the controlling shareholder favors to take over the company when it appears to be inevitable that someone will take it over. To Ecclestone, after surveying the possibilities of continuing to be in business with his current co-shareholders and the investment bankers that preceded them and are on the horizon again, he may well conclude that he and Formula One would be better off in the hands of a White Knight. In this case, The White Knights of the Grand Prix Table may turn out to be a Strategic Alliance Consortium of the major manufacturers of the world's automobiles, most of whom now already have a stake in Formula One, to wit, DaimlerChrysler, Fiat, Ford, BMW, Renault, Honda and Toyota. Although Ecclestone might have to suffer through a board meeting or two with the representatives of the Consortium, he knows them all already from those "Meet and Greet" sessions you see glimpses of on the grid just before the race, and Ecclestone already has their "proxy" when it comes to running the commercial aspects of Formula One. As an example of the laissez-faire attitude of the Consortium toward Ecclestone, DaimlerChrysler head Juergen Hubbert (DaimlerChrysler owns 40% of TAG McLaren), said in December 2000 that he was interested in creating a management structure around Bernie Ecclestone to protect the future of Formula One. How will we know when a White Knight is about to saddle up? Ferrari (or more properly Fiat, its parent company) may well lead the way because, according to the President of Ferrari, Luca di Montezemolo, that is how Ecclestone operates: when he wants to develop a consensus among the teams (and now the manufacturers), first he convinces Ferrari of something he wants to do and once they sign off, he goes to the others and says "See, Ferrari signed, now how about you?" If the Consortium of manufacturers should turn out to be the White Knight, things would have gone much as they do whenever a founding father of a family business decides to sell out and transition to retirement: the new investors sign a long-term employment contract with the founding father (in this case Ecclestone) to keep him on until the new owners can learn the ropes and the founding father receives cash for his stock and a handsome compensation package to stay on the payroll for awhile. In the end, once the dust settles, that could be what happens here: the EM.TV holdings will have to be sold to someone and since Ecclestone has started himself down the road of selling out, his choices now are either to buy back from EM.TV on the cheap what he sold to them dear last year (which I would not rule out) or maneuver the situation so that Ecclestone ends up with a better funded and more Formula One-oriented group as his co-shareholders, the Consortium, which will allow him to "cash out" of Formula One to a significant extent but permit him to continue to run the commercial side of the sport as he has now for decades. Finally, there is an intriguing settlement term which states that the "FIA has made it clear that its decisions will always be reasoned, and that those decisions may be challenged before national courts." Since these generalizations are all that have been released by the Commission, it is difficult to say at this stage exactly how Formula One fans will be affected by this settlement since the devil is always in the details. However, the recent announcement that the Montreal Formula One circuit will host a CART race in the years to come may be an early indicator of changes in the making. All these proposed terms of settlement are subject to a Notice provision of the European Commission which provides for an opportunity for third parties to comment on the proposed settlement. A full description of the settlement terms will be published in the Official Journal of the European Communities in the coming weeks. Notwithstanding the necessity for the further passage of time to complete these Regulatory Approvals, last week's announcement is sure to warm the hearts of the investment bankers who have long been waiting for this cloud over Formula One to lift for years. Now that the European Commission matter has been, for all practical purposes, put to rest, the other dominoes should begin to fall into place, hopefully but not certainly before the flag falls in Melbourne. And as to going back to Plan A - the offering of stock to the public - it may turn out that the Consortium will want to shelve that plan for awhile since the last thing any of these corporate titans want is yet another group of shareholders to answer to. And the public disclosure that accompanies a public floatation may not be the kind of scrutiny that the extravagant finances of Formula One can bear. Finally, given the conflicting business goals of the manufacturers outside of Formula One, it may be that a Strategic Alliance for the limited purpose of Formula One is preferable to a publicly owned stock corporation. As for me, I love the idea of the public holding shares in Formula One. I particularly love the idea of an annual shareholder meeting of Formula One, Inc., which, in my dreams, would be held at one of the host Formula One tracks on a rotating basis before the Grands Prix. The Stadium section of Hockenheim Thursday before practice would be a good starting point for the initial organizational meeting; the Grandstands on the main straight at Indy would be another good venue and, now that Silverstone will soldier on in the future as the site for the British Grand Prix, the Luffield corner seats should accommodate those shareholders who want to show up and ask a question. And for those out there on the muddy Spectator Banking, Bernie's digital TV Big Screens will permit them to follow the goings on. With over 350 million individuals in over 200 countries (the FIA's broadcasting statistics, mind you) out there watching Formula One on TV, the potential shareholder base worldwide is vast indeed. Of course every prospectus touting an investment always contains the cautionary legend in big bold type that says, in effect, Past Performance Cannot Predict Future Results, but that would not deter Formula One fans since those are the rules that govern the sport anyway! It will be interesting to see whether the institutional financiers lurking around Formula One these days will acquiesce in playing by the same rules of risk that Ecclestone and the team owners have been living by for decades.